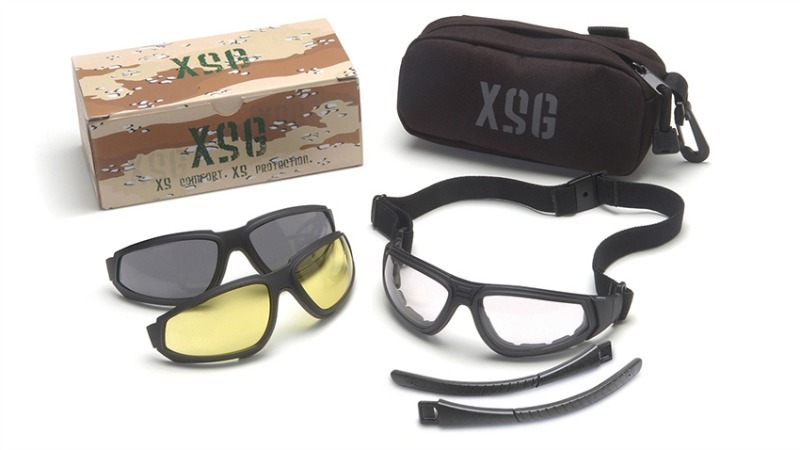 This 3 Lens Safety Glass Kit - the Pyramex XSG, has been a long-time favorite at EOD-Gear due to it's low cost, great performance and the ability to quickly change lens types and from elastic strap to standard ear stems. Hell yeah they're ANSI rated so you can hit the Grid or the Range with little worries. Exceeds MIL-PRF-31013 & ANSI Z87.1-2010 certified impact standards. Flame resistant foam blocks out dust and debris. Lenses have H2X anti-fog coating and are treated to reduce scratching and static. XS EASE Replacement lens system for quick & easy lens changes. Designed for maximum airflow to further reduce fogging. All lenses provide 99% UV protection. Clear, Gray & Amber lenses. Interchangeable temple arms & goggle strap with Quick Fit retainer for easy on/off. Protective case with velcro straps in the back for attaching to a belt and a snap hook clip on the side. Comes assembled with the gray lens and temple arms.